Well its been nearly a week since last video was sent out to donators, so now its time for everyone else to see it. I’ve re-captured and encoded it, so it has all the new stuff i’ve been doing since, but i think only eagle eyed viewers will notice most of the changes. The colours are better and it features some chromatic aberration towards the edges of the screen, which has done wonders for realism in-game, but is a little hard to spot in the video. Particularly after youtube had its way with it. The depth of field is not as strong in this video, i forgot to bump up the values to make it more noticable. To spot it, look for moments when objects are really close to the camera and the background will drop out of focus. Like when the camera goes through the car, or behind a tree. Also, the FOV has been lowered from 75 to 55, in an attempt to limit the object pop, which has worked for some areas, but still visible in others which is a shame. This does not appear in normal game play, only during the flythrough, so im assuming its to do with the elevated perspective available in the flythrough which allows the engine to see further and therefore have to draw a lot more. I recommend you watch it in as high res as you can, or even better, use a youtube video downloader and download the original file. Dont forget to Like it, subscribe and leave a comment. Enjoy and thank you for all your support! P.S There is a slight bug at the end which shows about 2 seconds of the start again. Not sure what happened there, i’ve trimmed on youtube though, so the changes should come into effect soon. One more thing, if anyone is curious as to how much of the island is shown in this video..
~ by newoldmate on 16/07/2013. It looks great. I think it works even smoother than the first video. Btw. I found this on youtube. I don’t know about that project. Not sure how the dino’s are done, and i’m not sure if they would work in CE2. Dino’s will be something i’ll tackle much later in development. My priorities are the island, and the controls first, so i can at least provide a good exploration experience. I know about your priorities and current goals. I’m just saying that those dinos look quite good and it would be worth try monitor those guys work. That… Was… AWESOME!!! I don’t care what you think or say about it, it looks so cool and real. I actually felt like I was flying through the jungle and was expecting a dinosaur to jump out at me at any moment. Can’t wait until you get more stuff done, because I really want to see the rest of the island. By the way, that giant face at the end, nice touch! Thanks mate, glad you like it. Its only going to get better, i promise. The flythrough is a refreshing feeling for me, as i’m used to the editor’s view, just buzzing about editing. The editor camera doesn’t bank / lean, so the flythrough feels quite nice for a change. However, when your actually walking around, and can experience the shaky camera view with the weapon sway and depth of field adjusting based on what your looking at.. its awesome. I’m really happy with how its looking even at this early stage. It could almost pass for real footage with a bit more work. Grandeur! The changes are really showing. And i love the vibrant colors, nice job! On a sidenote, will you include somehow the demo level as well? If i may, i can tell you that ‘Pine valley’ will be in it. Yeah, the demo level was a modified level that never made it into the final game. It was called Pine Valley and was in the Beta version of the game that was leaked a few years ago. If you haven’t played the Beta already, go find it, its awesome! Nice map btw. It has been a long time ago since you did any sort of map. 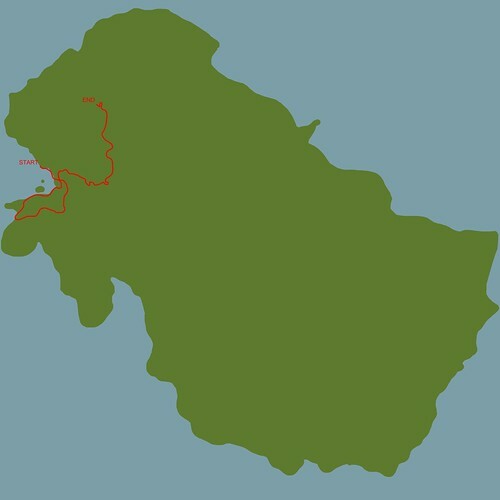 The last and best map i have of the island is/are ‘island_map_4096’ (painted over worldmachine map) and the ones with the detail around the town area with the landslides and radio towers on it. I really like those, i often look at them together with the early mapping shots (the ones with the red roads) to get an idea of the geometry. Call me a nerd but i love exploring that way. That was just beautiful… This is how Trespasser should have been. As I already told you. AWESEOME. Its so great to see this result after your hard work! I’m so exited about the finished game!!!! u work together with crynosaurs? Nah, they are CE3 Free SDK. Very different project with very different goals. A system that can run Crysis very well would be advised. I’m not sure what the memory requirements will be, but it will be pretty big i think. It will be about on par with 4-5 Crysis maps all into one, with detail levels about 2-3 times that of the standard Crysis maps. I have not yet changed any textures for high res versions, its all standard Crysis stuff for now. Once high res textures are added and then all the models for houses and other objects, memory use will climb rapidly. My current system specs are: amd 64×2 3000+, 3gb ddr2, 2gb 6950. I get higher FPS playing this than i did playing FarCry3, and this is more detailed. Just found out about this after looking up mods after I decided to download and replay Trespasser. I am beyond hype!! Already sent ya a donation. Not much, but hope it helps. No you have me all giddy! Just the thought of replaying Trespasser, as reimagined by a fan and upgraded to modern day graphics…I’d love to see the day! 😀 Keep it up bro, don’t back down, you’ve done a phenomenal job so far!